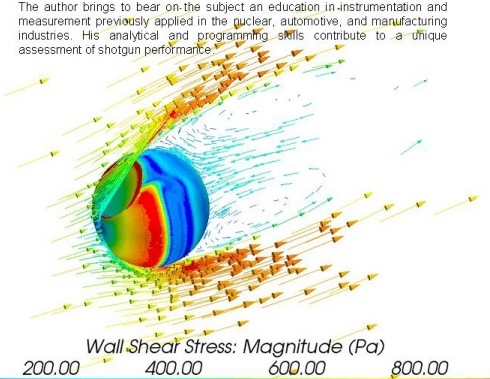 Sporting Shotgun Performance by Andrew Jones: A Must Read? The day after hopping off the plane in Las Vegas, I had a chance to visit with Bruce Buck, one of the finest and most respected shotgun experts in the world today. The always inquisitive, always thoughtful Mr. Buck asked what I thought of the new Dr. A. C. Jones book. Well, I wasn't familiar with it although I was aware of Andrew Jones' Shotgun Insight programs found at http://www.shotgun-insight.com/ . Bruce thought a lot of this new work, so one of the first things I did after returning home was to order a copy. Bruce Buck, of Technoid and Shooting Sportsman renown, is always ahead of me on things like this. If Bruce says something is worth checking out he is invariably right so I didn't hesitate. Shooting Shotgun Performance is a fabulous read, one of the most refreshing and entertaining contributions to the art and science of shotgun patterns in decades. That said, its contents will likely bother a few readers who have failed to retain the prior contributions of Burrard, Oberfell & Thompson, Zutz, and Ed Lowry. Andew Jones promises a unique assessment of shotgun performance and he delivers. This is a 290 page effort, including 196 illustrations and 36 charts. It is an impressive work, to say the least. Removing ignorance is not something everyone appreciates, the notion that ignorance is bliss has the merit of comfort. It is far easier to just forget any attempt at reason and basis and parrot all the old goofy anecdotal nonsense that has been around for years. Naturally, this anecdotal or wishful thinking type excretion has had a lot of well-funded help from seriously impaired marketing departments. Anyone can assert anything, regardless of being able to show it. In some ways, the shooting sports industry thrives on it. We all have to be careful about the precision with which words are used. Some times, it seems that Bob Brister and Ed Lowry came up with more things after their passing than when they were alive. All kinds of nonsense regularly gets attributed to them that they never implied, much less actually wrote. So it will likely be with Dr. Jones' new work. Stating that based on specific tests, information and belief, that there is nothing to support a condition is not the same as disproving it. That is a fundamental distinction, one that is worth keeping in mind as you work through this book. The more you understand, the more you can focus on what really matters and don't sweat the small stuff. This way, you can enjoy hunting, shooting, and practice more by freeing yourself from what cannot be shown to make a difference and has no real-world benefit. Again, finding that something has no basis or is essentially of no practical benefit is not the same as disproving. It is simply discovering nothing that supports it. To those that understand this, no further explanation is necessary. To those who won't, no explanation will suffice. I like the way the book is presented, challenging the reader with conclusions and then offering extensive data to support those findings, after piquing your interest. You'll read that gauge is meaningless to a certain extent, as is back-boring, it takes only one pellet to break a clay, shot string warrants no concern, short shot columns don't mean much, steel doesn't necessarily pattern tighter than lead, and Hevishot stinks. You'll also learn that plastic shot cups don't mean much to most shooters and that all the twaddle about gauge is often a waste of time. Trying to read breaks is a silly waste of time as well, obsessing over choke style is often another. It will be the source of tremulations to some, just to think that any nickel or moment they have ever invested in back-bored or more correctly, overbored barrels is a waste-- but that's what the best evidence is. All this and more are discussed in these 290 pages. I'll confess that many of Dr. Jones' findings are unsurprising to me, personally. They comport seamlessly with prior observations in many cases. Sir Gerald Burrard was right about shot string and that was from 1927 or thereabouts. Ed Lowry revisited it and confirmed it, as you can read here: http://randywakeman.com/lowryshotstring.pdf . A modified choke with lead hardly means a full choke with steel. Don Zutz noted that bit of bogus information a long time ago, but apparently marketing departments have decided to ignore and forget about it. I like the perspective of Dr. Jones and the way he looks at things. I found it refreshing and I think you will as well. On the subject of gauge, there is no wunderkind of gauges. Payload wins the day, not a gauge, and for many applications the limitation of the gauge is payload, little more. Dr. Jones goes farther than that. You'll read that, yes, a 12 gauge is likely capable of tighter patterns than sub-gauges, measurable but still insignificant compared to payload. A tighter pattern is naturally only of value if you want a tighter pattern than your gun is already capable of achieving . . . which most wingshooters who like to eat what they bag are not at all looking for. There are many questions left unaddressed and unanswered. After some time with Sporting Shotgun Performance I came away with new found respect for Sir Burrard, considering that the technology of the day was 1920s technology. There are a few areas not of general interest to American shooters, such as the fiber wad vs. one-piece plastic shot cup analysis. That hardly invalidates it, it is just that Americans are quite comfortable with plastic and the European bio-degradeable wads haven't caught on as of yet in the U.S., although leaving less trash in the field isn't a bad idea. If there is a sin of omission, I suppose it would be the effect of forcing cone modifications on patterns and, to a lesser extent, the effect of shooting a 2-3/4 in. hull in a longer chamber. Dr. Jones offers his opinion about forcing cones as a generality, I'm inclined to agree, but nothing is further explored or quantified. After absorbing a work of this size, I'm reminded that all of us are quite free to get up off of our most delightful posteriors and produce a work more comprehensive and extensive on our own, something that hasn't been attempted for at least fifty years. I'm delighted that Dr. Jones has released this book and I can't recommend it highly enough for those with more than just a casual interest in what makes shotguns work, with results analyzed and tabulated to show trends or reveal that there is no support for some preconceived notions. It is a terrific contribution. To get your own copy, follow the link at http://www.shotgun-insight.com/books.html just like I did.